Traveling to different countries and experiencing different cultures is an amazing eye-opening experience. For me, Jerusalem was a place shrouded in mystery. I had read and heard so much about this city that a place like this almost did not seem real. From this city arose great kings and great wars -- a city far too extraordinary for a Southern-Cal girl like me who hadn’t even traveled out of the state yet. But when I watched a 45-minute documentary of Jerusalem last year, I told myself that I had to come to Jerusalem one day. Sixteen months and many miracles later, I live and study abroad just a mere five-minute walk from the Old City and right on the outskirts of the New City. I’ve been here for 76 days now, and I can confidently say there really is no place like this anywhere in the world. It’s truly a place that’s different. The Old City is a mere 1 km square-mile city that is home to over 30,000 people. This Holy Land is a city with Jews, Muslims, Christians, Catholics, Atheists and Agnostics...all living separate yet overlapping lives. A city that still has a wall bearing the scars of past wars. A city that was destroyed multiple times -- and yet is still standing. It is in the city I encountered some of the best stories -- stories I know I’ll tell for a lifetime. I want to share one story that has dared me to be different and to realize that life, like a race, is only meaningful when you run it alongside others, instead of only trying to get ahead. There was a 10K marathon happening in the Old City, and I spontaneously decided to run it! I signed up two minutes before registration closed and an hour before the actual race started with no long-distance running experience whatsoever. I started off well, but needless to say, my adrenaline quickly wore off and by the last kilometer, I had completely exhausted myself. I decided I could not run the rest, so I gave up running and started walking up the steep hill towards the finish line. All of a sudden, an older runner came out of nowhere and started running up beside me and speaking to me in Hebrew! I thought he was trying to tell me I was too slow, but then he started speaking English to me when he realized I didn’t understand him. This is when he told me, “Don’t give up! You are almost there! You can do it!” He was panting so hard himself; yet, he still made the effort to motivate me. However, I really felt like it was physically impossible for me to run anymore, especially up such a steep incline. I told him I couldn't continue, and I thought he would depart and finish the race himself. But no -- he literally took ahold of my hand and mustering up all his strength, he pulled me up the large hill and at the top, he let me go so that I could finish my race strong. This one act left me feeling incredibly touched. This older man was Jewish, and in this cultural and religious context, men do not usually strike up conversations with women who are strangers, nor do they have any physical contact with them. However, this man dared to be countercultural. He dared to be different. May we all dare to be different in that we stop to see people and take notice of where they are at. What he did was considered pretty extraordinary and very outside of his cultural norms. I can't help but think he's my guardian angel! This man reminded me that when you really see people in their darkest moments and lend them a hand instead of just running past them, you are making such an enormous impact, bigger than you'd ever know. Traveling to different countries and experiencing different cultures is an amazing eye-opening experience. The Red Bulletin encourages traveling on your own terms. To understand more on exploring authentically, read Kimi Werner’s story here. 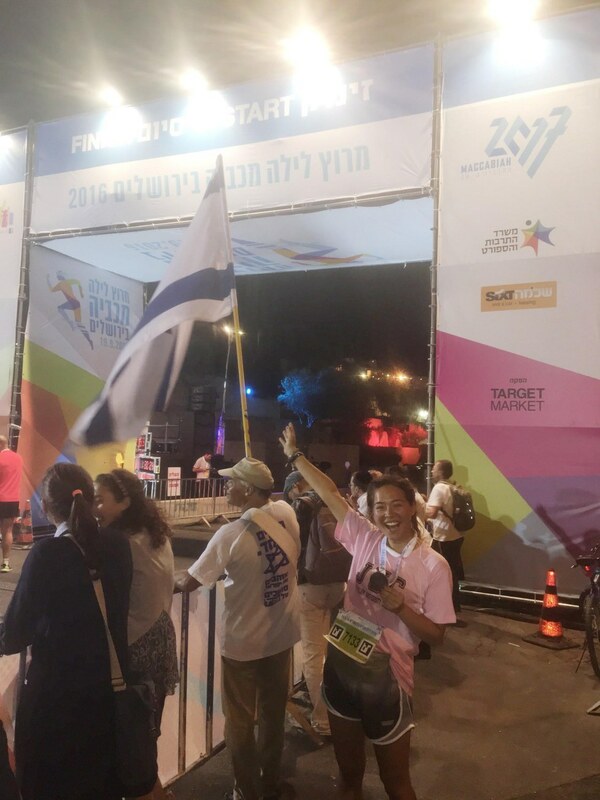 Finished the 10K marathon in the Old City of Jerusalem | Day 27 of my journey. Check out more fun and exciting Red Bulletin content here!